I have not worked out since Sunday because I injured my shoulder. However, I feel fantastic today and jumped right back in. 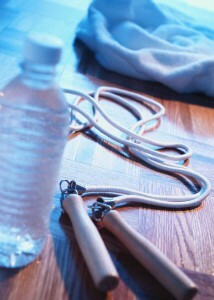 Today was my third Tabata TRX class at The Barre Studio in Delray Beach, Fla. This time, the class was much smaller than normal. As always, we started with a jog around the block. This time, I was first up on the TRX ropes. We did reverse crunches, single leg and pikes. Once we finished that, we started round two with cardio. The cardio was burpees and squats. After that was completed, we stepped outside for jump rope and jumping jacks. I cannot remember everything we did, but I really love this class. At times, I have to stop to catch my breath, which means it is challenging me. It really gets the heart pumping. I also like that each class changes routine. The change is great because it encourages the metabolic rate and fat burning component. I also noticed that the instructor was wearing a Polar heart rate monitor. I just ordered myself one to see how many calories that I am actually burning during these workouts. Once I get it in the mail, I’ll be sure to write a review on it. With that said, today was awesome. I had my green smoothie for recovery, and I am going to take it easy for the rest of the day. I also want to note that since my shoulder is better, I will be posting my workouts again. Stay tuned! Metabolic Rate: How Does it Work?